My daughters just love french fries. What little kid doesn’t like french fries, right? Time to make her some healthy french fries. We hadn’t had french fries in quite some since we switched to a whole food diet. One day, we got a bag of russet potatoes in our co-op basket, so we decided to make a healthy french fry recipe for her. I think these french fries came out pretty good. There was no talking when the french fries were being eaten, and there were no leftovers as they were being inhaled. In our world, that spells success. Most store bought frozen french fries are laden with saturated fat and too much sodium, but not these. 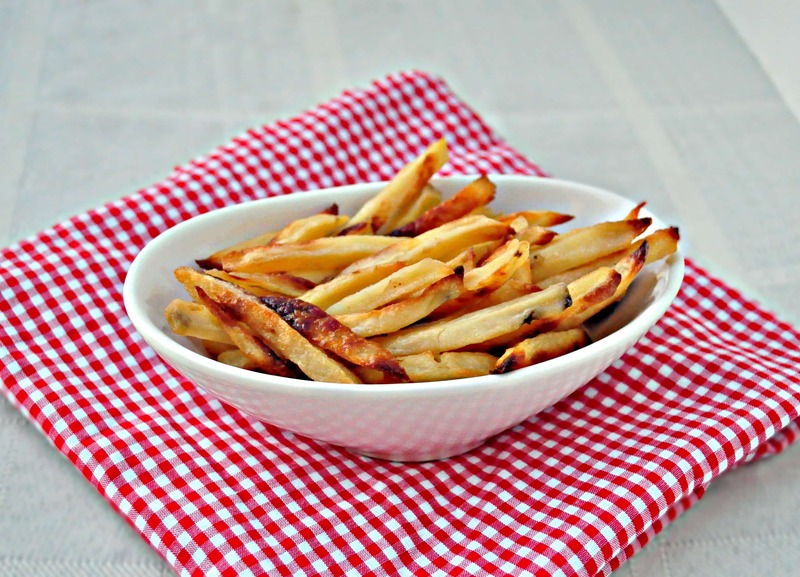 These are fries you can feel good about giving to your kids. This recipe would also work well with sweet potatoes. Pan fry the potatoes in the oil for about 5 minutes on medium-high heat. Transfer them onto a greased or lined baking sheet and bake for about an hour. Shake the pan every 15 minutes or so to get them to cook evenly. Feel free to add extra salt and garlic at the end to suit your taste. We went a little easy on them since we fed them to our daughter. These would go great with my Black Bean Veggie Burgers or my Sweet Potato Veggie Burgers. I do something very similar. I brush olive oil in the bottom of the pan, slice a couple of potatos into "rounds" and spread in the pan. Brush tops with olive oil. Sprinkle with sea salt and garlic, and, because my son likes spicy, sometimes red pepper. Bake for about 30 minutes, turning half way through. My 11 year old likes these better than regular french fries! I made these tonight using a mandoline slicer on the thick julienne insert, they turned out like shoe string fries that stuck together in the oven. The taste was still good. I was wondering what tool you used to get the thick fries in the picture? Thank you! Thank you, I'll check into getting one! Did you leave the peels on? No, but either way should work. These sound wonderful. We use a potato slicer so they are evenly cut and then soak them in water to remove the starch. We then bake them on parchment paper to prevent sticking. They are tossed in oil (of your choice), salt and pepper. They come out crispy and delicious! Great idea to use parchment! Does parchment paper contain any harsh chemicals like plastic or Pam does? No I don't believe so. It's just paper. Any particular reason you used grapeseed oil over refined coconut oil? Better under heat? I use virgin and refined coconut depending on the recipe and who will be eating it. At the time I wrote this recipe, I had not yet tried coconut oil. Now I use coconut oil instead. I'm glad they were a hit! My kids don't always want to eat what I cook either. It's an everyday struggle. My daughter will only eat the fries if they're crispy - ok, like McDonald's! Ugh! I'm trying different things, but she says they're too soggy. Would I only be able to get a crispy fry by frying it? If so, what oil would be healthy to do that? Or wouldn't frying be healthy at all? If you were going to fry them, I would suggest using coconut oil. ^^BTW, I wanted to mention this for people that are skeptical on the coconut oil. I actually do usually notice a coconut flavor with coconut oil and was hesitant to use it with french fries but they did not taste coconutty at all. Just delicious!